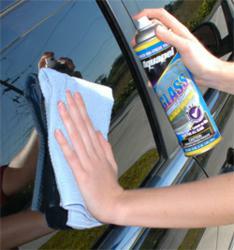 Low Price Auto Glass is offering a free can of Aquapel glass cleaner with any window installation. San Ramon and Pleasanton windshield glass repair shop, Low Price Auto Glass is offering a free can of Aquapel glass cleaner with any windshield installation in the shop. Designed for professional application on windshields, side windows, rear windows, glass mirrors or any other glass surface, Aquapel is a long-lasting glass treatment. It repels rain for remarkably improved vision; makes it easier to clear ice, snow, dirt and bugs; reduces glare in the rain, especially at night; and helps seal glass to protect against hard-water marks. Using technology innovated for the aviation industry, Aquapel Glass Treatment forms a chemical bond with the glass, which increases water repellency, causing it to bead and easily shed off the glass. These fluorinated compounds last six times longer than silicon-based products and apply in minutes to a clean, dry windshield or any exterior glass surface. Additionally, Aquapel remains highly effective after months of normal use, including driving in the rain and snow, car washings, and glass cleanings. “We also give you a lifetime warranty on all labor. This includes air or water leaks or anything else related to the installation of the glass,” Shant Hagopian of Low Price Auto Glass said. Low Price Auto Glass windshield glass repair specialists provide installations and repair services and can address any crack or chip. The shop only offers the highest quality auto glass from major manufacturers, such as PPG, Carlite and APtech, as well as dealer glass for all of its windshield glass repairs and replacements. It also utilizes only the best sealants and adhesives. For more information about any of Low Price Auto Glass’ products or services, call 925-241-5230, view the repair shop on the web at http://www.lowpriceautoglassdublin.com or visit 6355 Scarlett Court, Suite 8, in Dublin. As one of the largest independent retail glass companies in the U.S., Low Price Auto Glass is able to purchase high-quality windshield glass at lower prices, transferring the savings to its customers. Established in 1999, Low Price Auto Glass serves customers in Dublin, Pleasanton and San Ramon. Along with general windshield glass repair, it also provides car window tinting, and windshield chip repair and replacement, as well as back glass, quarter glass, and door glass repairs and replacements.